Sep. 10, 2017 8:20 a.m.
Canadians who fled to Florida in search of warmer climes are bracing for the worst as a major hurricane descends on their new home state. Some hunkered down with supplies while some fled in fear as hurricane Irma bore down. The Category 3 storm is expected to gain strength as it sweeps across the water from Cuba to Florida, where it is expected to wreak havoc across the state starting Sunday. Reports of Irma’s pending impact have been circulating for days, causing anxiety to soar among residents uncertain whether to heed mandatory evacuation orders or try to ride out the storm. For Toronto-born Gavin Wolpert, the issue was moot. He, his wife and three children booked flights to New York City early in the week, but the increasingly dire warnings prompted them to move up their plans to flee to safety. They rented a car and slipped out of their home in Palm Beach Gardens, Fla., mere hours before the roads clogged with other residents with similar plans. From there, they drove to Charlotte, N.C., where they eventually caught a plane to New York City and relative safety. Wolpert said his experiences with previous, weaker hurricanes made it clear to him that he and his family needed to get out. Wolpert said the experience of past hurricanes sounded like a battering ram clobbering his concrete home, adding he felt it was best not to expose his three children under the age of 10 to potential alarm. Even as forecasters downgraded Irma’s severity Saturday, all anticipated the storm would be among the most severe to hit Florida in decades. The hurricane was originally expected to hit the Miami area, but a westward shift Saturday saw it bearing down on Tampa with winds of up to 200 kilometres per hour. Irma was classified as a Category 3 hurricane, but forecasters expect it to strengthen as it barrels toward the area. The storm has left more than 20 people dead in its wake across the Caribbean, ravaging such resort islands as St. Maarten, St. Barts, St. Thomas, Barbuda and Antigua. Meteorologists are predicting Irma’s centre would blow ashore Sunday in the perilously low-lying Florida Keys, then hit southwestern Florida and move north. In one of the biggest evacuations ever ordered in the U.S., about 6.3 million people in Florida — more than one-quarter of the state’s population — were warned to leave. For at least one Canadian currently calling Florida home, that option was out of the question. Shruti Patel of Waterloo, Ont., said a scarcity of gas and extreme gridlock on local roads made it impossible to drive to safety. Instead, she stocked up on food, water, candles and batteries, powered up her electronic devices and prepared to ride the storm out from her apartment in Estero, Fla.
Concern also gripped Canadians further away from the centre of the storm. 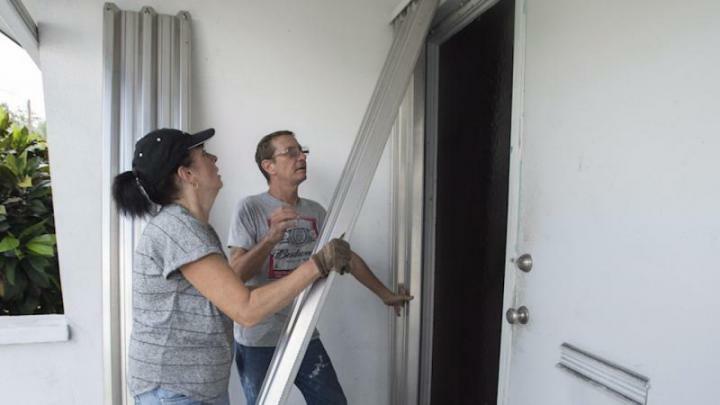 Safe at their primary home in Prince Edward County, Ont., Bob Ritzer and Vivian MacLean were anxiously wondered about the fate of their ground-floor condominium in Fort Pierce, Fla. The shift in the storm track may have offered them at least a partial reprieve, but both said they were concerned about potential flood damage in Irma’s wake. That outcome, Ritzer said, causes anxiety about the future. Global Affairs Canada said it is closely monitoring the progress of Irma, as well as hurricane Jose, which is currently gearing up to hit the same region in the coming days. Officials said they had received calls from about 222 Canadians across numerous Caribbean islands requesting consular help, adding that number is expected to rise as Irma reaches Florida. Disaster assessment teams are poised for deployment if necessary, they added. “There are many Canadians in hurricane Irma’s path, and our teams are doing their best to ensure that we get in contact and help everyone as necessary,” Global Affairs Parliamentary Secretary Omar Alghabra said in a teleconference. Anyone needing consular assistance is urged to contact their nearest government office or the Global Affairs Emergency Watch and Response Centre. Daniels: New chinook regulations don’t mean there’s no fishing!